Last week was not so good to me. I vowed I would do better and I did. I tripled my miles from last week! One of the biggest motivators for me was how awesome I knew I'd feel if I was more active this week. I took the dogs for walk after work, and I loved it as much as they did! Another huge factor in my success this week was one of my amazing coworkers. We have been taking mid-day breaks and walking a mile or so outside. It make a huge difference in my afternoon productivity and energy level. Also, I'm sponsoring a giveaway on Glossy Blonde; you should stop by and enter for a chance to win a $20 Target gift card! You're doing awesome! Keep up the great work! that's awesome that you tripled your miles from last week! You're doing so awesome! Tripling your miles? That's crazy! PS - I can't comment on Niki's post but I want to win that Target's gc!!! Go girl! You are inspiring me to want to walk more too! ok,this is awesome! i am definitely going to start and conquer this challenge! you are kicking some serious booty! so glad glossy blonde sent me by! Way to go on the miles - Glossy Blonde sent me! That's awesome. I've been a runner all my life and have completed 5 marathons. Two years ago I was injured and I'm finally at a point where I can start to run again. 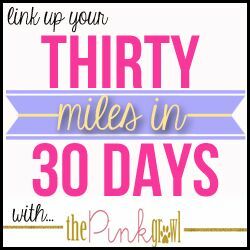 You have inspired me and I think I am going to work on a run/walk 30 miles in 30 days! Love it. Thanks for the motivation! P.S. Glossy Blonde sent me!